The new PRW-6000 series is equipped with a hand-concealment function for clear viewing of the digital display as well as advanced sensor functions, while also showing unparalleled attention to detail and emphasizing wearability, ease of use, and readability. 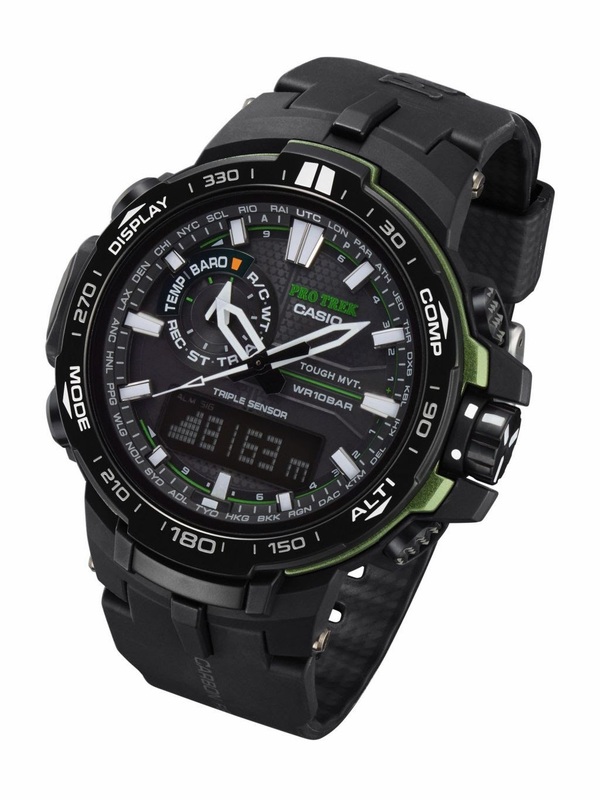 In crafting the PRW-6000 series, Casio sought to make these PRO TREK watches very comfortable to use. In addition to their enhanced functionality as outdoor gear that “senses” nature, the readability, ease of use, and wearability of these watches have been thoroughly optimized. Along with a larger LCD, which displays digital data using a dot matrix, the new watches are equipped with a hand-repositioning function that temporarily moves the hands away from the display, enabling the wearer to clearly see the sensor data on the LCD even at times when the hands would otherwise be in front of the display. They are also equipped with Casio unique Smart Access system, featuring an electronic crown switch with quick-lock for even easier operation. By pulling, turning and pressing the crown, the wearer can perform tasks such as adjusting the altitude or setting world times for different cities. These watches are also very comfortable to wear, with the slimmest boasting a profile of just 12.8 millimeters for a lower profile than any other PRO TREK analog+digital watch that incorporates both the feel of analog and digital presentation of information. The wearer is sure to enjoy the combination of the analog feel with digital information usefulness. Equipped with the latest Triple Sensor Ver. 3 technology, the PRW-6000 series determines compass bearing, barometric pressure/altitude, and temperature with high precision. These watches also feature an atmospheric pressure trend alarm that notifies the wearer of sudden swings in atmospheric pressure, the Tough Solar™ power system that charges the watch even in dim light, and Multi-Band 6 technology for receiving time-calibration signals transmitted from six stations around the world. They are even equipped with two separate LED lights to illuminate the dial and LCD separately, and the special PRW-6000Y models have a wristband reinforced by a carbon fiber insert for high strength and durability. All in all, the PRW-6000 series offers all the utility required for a high-spec outdoor watch. The PRW-6000 series uses a pressure sensor with enhanced measurement accuracy and the latest compact magnetic sensor, which is 95% smaller than that in the conventional combination model (PRW-5000). Casio’s proprietary sensor control IC, combined with these sensors, achieves greater accuracy and faster measurement. For example, continuous measurement of compass bearing has increased from 20 seconds to 60 seconds, greatly enhancing the utility for map reading and route finding. Altitude measurement time has been significantly reduced from five seconds to one second, with accuracy also improving from five-meter to one-meter increments, ensuring fine precision readouts of current altitude. The PRW-6000 series uses Multi-Mission Drive to enable each hand to serve multiple functions by moving the hour, minute, and second hands independently. The watches are also equipped with Casio’s Smart Access system featuring an electronic crown switch that gives access to functions using the familiar operations of pulling, turning and pressing the crown. Although an advanced feature, it is very easy to use, enabling quick access to functions out in the mountains without the need to perform complicated operations. The PRW-6000 series is equipped with a hand-repositioning function that temporarily moves the hands away from the LCD at times when they would otherwise be in front of it. This ensures clear viewing of readings for altitude/atmospheric pressure and temperature whenever the measurement is taken. Listening to the opinions of professional alpinists and mountain guides, Casio sought to create a thinner profile that would not interfere with wrist movement when climbing with ropes and an ice axe. With the slimmest of the series boasting a profile of just 12.8 millimeters, for a lower profile than any other PRO TREK analog+digital watch, it can be worn on the wrist without discomfort even during long climbs. Receiving time-calibration signals transmitted from six stations in the world (two in Japan, and one each in China, the US, Germany, and the UK), the watch automatically adjusts the time, ensuring that the correct time is always displayed. The PRW-6000 series is also equipped with the Tough Solar™ power system that charges the watch even in dim light so that it can be used with peace of mind even in the mountains. The PRW-6000 series indicates a sudden spike or drop in pressure using an alarm, which is helpful in predicting sudden changes in the weather.LED lights improve readability in the dark. The PRW-6000 series is equipped with an LED light to illuminate the dial and an LED backlight to illuminate the LCD. Users can check the time and sensor results when up and about at night or before dawn. Wristband reinforced by a carbon fiber insert for high strength and durability. The PRW-6000Y models feature a resin wristband reinforced by an insert made of carbon fiber, which is a very strong material. With excellent tensile strength and durability, this strong wristband has been made to last.